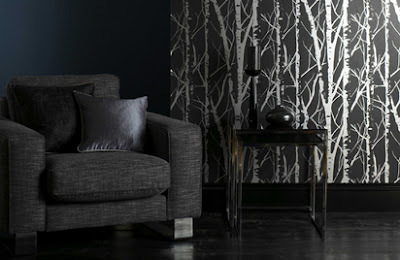 whether in wallpapers, upholstery, fabrics or accessories? Follow our guide to getting it right. Be bold and mix modern and traditional prints in vibrant hues for a show-stopping scheme that oozes retro style, but is actually bang up to date. Why does this look work? The trick is in the limited use of colours and in the consistent approach to shapes. There's no hard and fast rule when it comes to colour scheming, but if you stick to three different colours at the most, you will find the room easier to bring together. Within those three different colours, don't forget there are literally hundreds of tones to choose from, so your scheme should end up with a layered, warm look. So, here the base for the scheme is a combination of warm browns - in the flooring, side table, cushion fabrics and wallpaper. The second background colour, the wine shade within the sofa, blends perfectly with the browns, while the highlight shade, a bold orange, picks up the warm tones in both the wood and wallpaper. As for the furniture - it's a real mix. There's a retro style sofa, a contemporary high-gloss coffee table and a period style mirror. But, it works because all the shapes are square-ended, so none fights the other for attention. Then, the table lamp, which has all the colours of the scheme within it, breaks all the rules for a fun finish.